Small Business Saturday is designated to create a buzz around mom-and-pop businesses, and help them receive, well, more business! The reason why it's great to support these businesses, is that it not only shines light on the entrepreneur spirit, but it expands the community that you live in, or live near by; allowing you to invest in a gift from local artist or rarely seen vendors, making your purchase unique and treasure-felt. 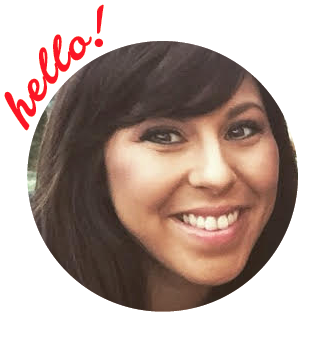 Here are six businesses from Orange and Los Angeles counties that would love to meet you. Get ready to shop, eat, snack and pick up a treat for fido! SUO Boutique, in Brea and Monrovia, California. The store's clothing ranges from extra small to large, and rarely holds items for curvier girls, however they have an array of cute shoes, earrings and other accessories to complement any outfit, and their slew of knick knacks had me jumping over the moon! I wanted to buy everything, but had to reel it in. 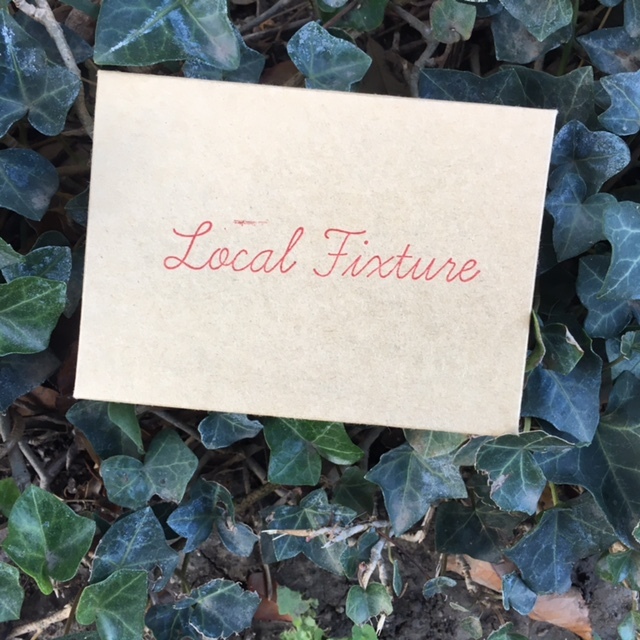 Local Fixture in Whittier, California, has an eclectic display of jewelry by local artist, bath and toiletry items such as hand-crafted soaps and perfumes, carries cards and several other gifts for men, women and kids. They have a newly section for the outdoor adventurer who likes, Patagonia, and unisex clothing to support the local city of Whittier "where the girls are prettier," or so the t-shirt description said so. The dark wood frame that encompasses the shop, houses some of the most hip and friendliest sales guys and gals on Bright Avenue, who will wrap up any purchase free of charge. If you get thirsty or need a snack, you might pick up a cold brewed coffee drink, which is always on tap, or try one of their high-end donuts from Donut Snob, served every Friday and Saturday. Prices range from $3 to $229. Bailey's street kitchen is located on Bailey Street, in Whittier, California. The family owned restaurant is pretty small in size, but the food packs a delicious-and-rather impactful, punch! Whether it's Italian, Mexican or American food you're craving for breakfast, lunch or dinner, Bailey's Kitchen has it all for you. Since I'm a breakfast addict, I dove right into the chocolate chip pancakes, while my boyfriend can be seen cutting into their delicious chicken and waffles. If you're looking for something a little more quaint, check out Crepes & Grapes, adjacent to Bailey's Street Kitchen. The Uptown Whittier cafe serves up breakfast, lunch and dinner with a Paris vibe. Serving up items with names such as Croque-Madame and Belle Matine. Featured below is the scrambled eggs and asparagus, topped with goat cheese, a side of a rather large parfait and some hot chocolate that is so delicious! I've stopped in here on numerous occasions and have found that my favorite protein plate is the chimichurri demi steak and eggs breakfast. If you have little ones, their kids menu is perfectly suited. Prices range from $6 to $25. Marston's Restaurant in Pasadena, is a causal little spot that serves up delicious American-style food in a cozy little cottage. Be mindful that wait time varies as the staff hustles and bustles to keep the movement of service as fast as possible in this little nook. The french toast is an absolute must, as it's engulfed in corn flakes for crunch and added texture. If I could squeal "yum!" through the computer screen, I would. Live further north? Check out their second location in Valencia. Prices range from $2 to $15. Now I only have one place for snacks to talk about and that's because it's by far the most delicious I've ever tried. 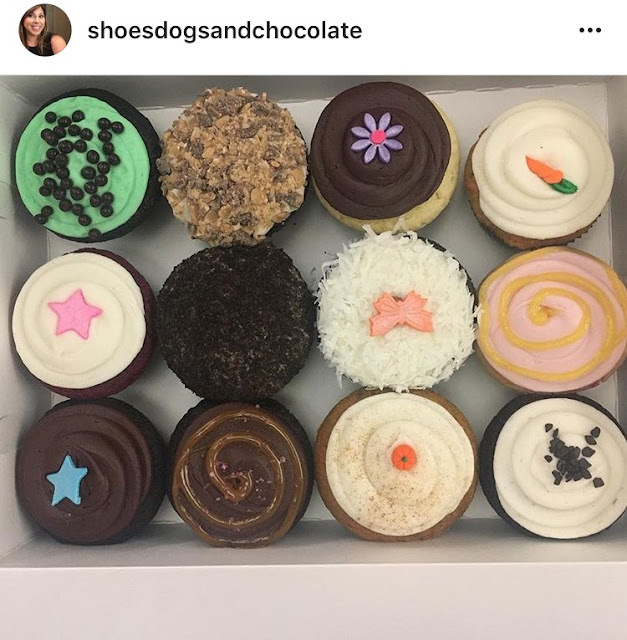 With two locations, both in Pasadena, California (just a few blocks from Marston's), Dots Cupcakes will make your eyes light up the moment you walk into the boutique-style store and inhale the smell of freshly baked cupcakes, which they create daily. You may even want to press your nose up on the glass, but don't, that's just weird and not sanitary. A few days a week, DOTS CUPCAKES changes up the array by rotating in daily flavors. Choose between regular and mini size. What's great about DOTS, is just an added bonus, they are so friendly and always representing their city, the local community and welcoming to every visitor that they meet. They're also a green company and use soy ink and recycled paper for their wrapping and boxes. Thank you Dots and your incredible associate who created the Dallas Cowboy themed birthday cupcakes below for my boyfriend. They were a hit! Prices range from $1.75 to $33. I could never forget my cutie patootie, Bella, or her many doggy neighbors, so this one is for them! After you grab your cupcake from Dots Cupcakes, cross Colorado Boulevard and head west to The Dog Bakery. It's a hidden gem for dog treats and birthday cakes specifically made with only the finest ingredients edible to dogs. All items are hand made in the USA. The company has three locations in California, so if you're near Venice or Beverly Hills, don't fret. You can pick up your orders there. Not interested in buying a birthday cake for you dog? Not to worry, The Dog Bakery also houses toys for small and large pups, collars, leashes, dish bowls and many other necessity items in between. 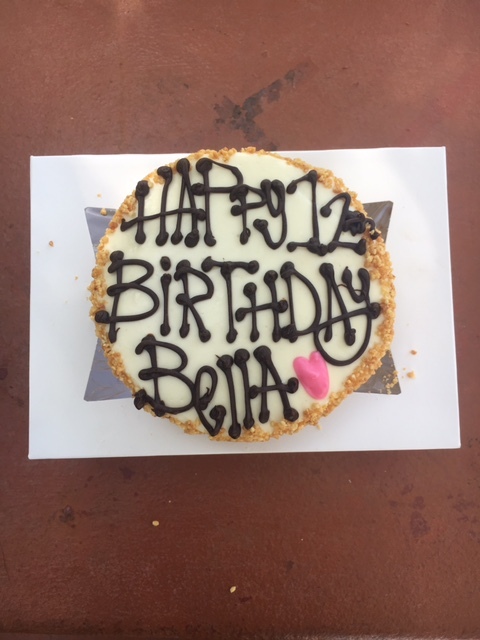 Bella turned 12-years-old in October, and she deserved a cake of her own, so that's just what she got. The adorable associate made it just right, and Bella was doggy stuffed. Seen here is a 12" round peanut butter and carob cake. If you find a great spot that's not listed here, please write me, I'd love to check them out. Have a great weekend! In the spirit of Thanksgiving, it can be very easy to get caught up in, well, sharing your delicious eats with your favorite fur buddy, however there are many ingredients that can be harmful to pups if consumed. Please check out the list below. In addition to these seven items, wine, beer and garlic must also be avoided. For more information on how to protect your babies, and a more detailed list, please check out this post by the Humane Society. There's something so validating about going to a poll station and physically entering in your choices. 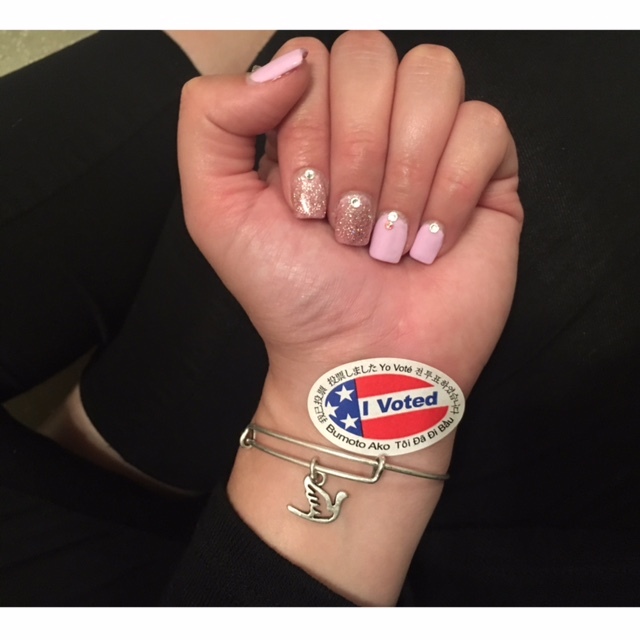 Although this election is probably the most terrifying election I've been alive to witness, I took the Holy Spirit with me. At the end of the day, what is meant to be will be, and I will put my trust in God first and foremost, but I'm also so grateful for the 19th Amendment of the United States Constitution that passed in 1920 to officially give women the right to vote; and allow me to share my voice. Whether you voted for Trump or Hilary, or put your own name into the empty subject line, know that our nation was founded upon those who believed in God and that this country and our world is all suffering and wants and need love and understand. Pray for us all.